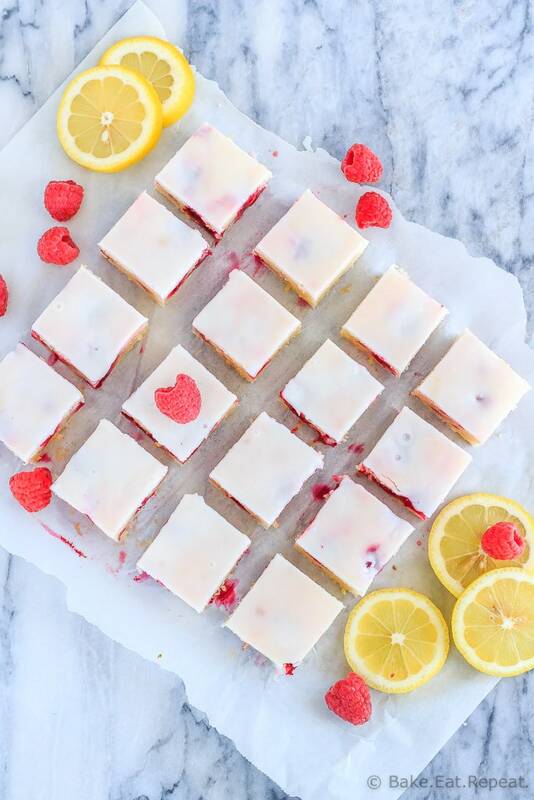 Fast and easy to make, these chewy raspberry lemon blondies are just the right mix of tart and sweet – and will disappear way too quickly! Brownies or blondies? Which do you go for if given a choice? I have always been solidly in the brownie camp, considering blondies kind of a waste of time (and calories!) since they don’t even have chocolate. And no, I don’t count white chocolate which I suppose they often have. It’s not really chocolate. But I have to tell you, these raspberry lemon blondies may just be changing my vote. They are pretty stinking hard to say no to. Raspberry and lemon together in a chewy little bar with a tangy sweet lemon glaze – I don’t know too many people who would say no to that. Plus they’re so easy to make. If you have some lemons and some frozen raspberries (I would think fresh would work fine too, but I have to say I never waste fresh raspberries in baking – they get eaten way too quickly for that) you can have these bars coming out of the oven in no time at all. 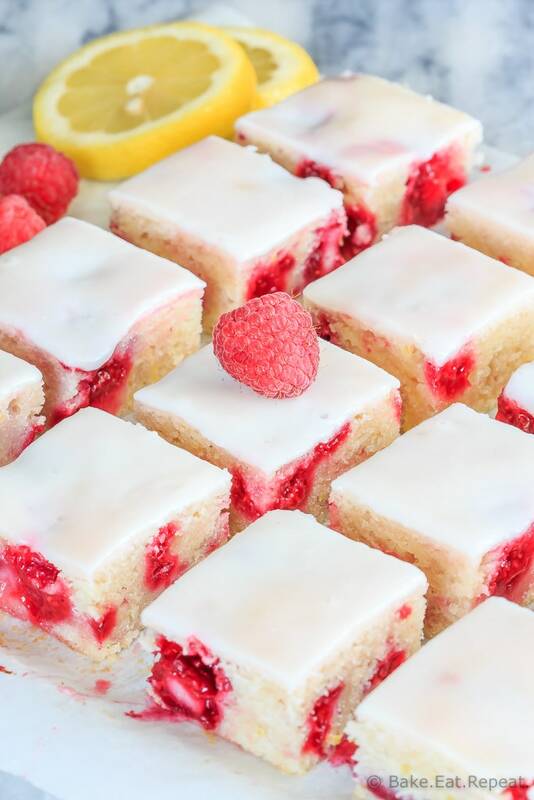 They mix up easily with just a whisk, so no fancy equipment needed for these raspberry lemon blondies at all. And they’re great both with and without the glaze, although we did prefer them with it. It’s a very, very thin layer of glaze though, so if you like a thicker glaze on your bars you will want to double it. Also – store these in the fridge. 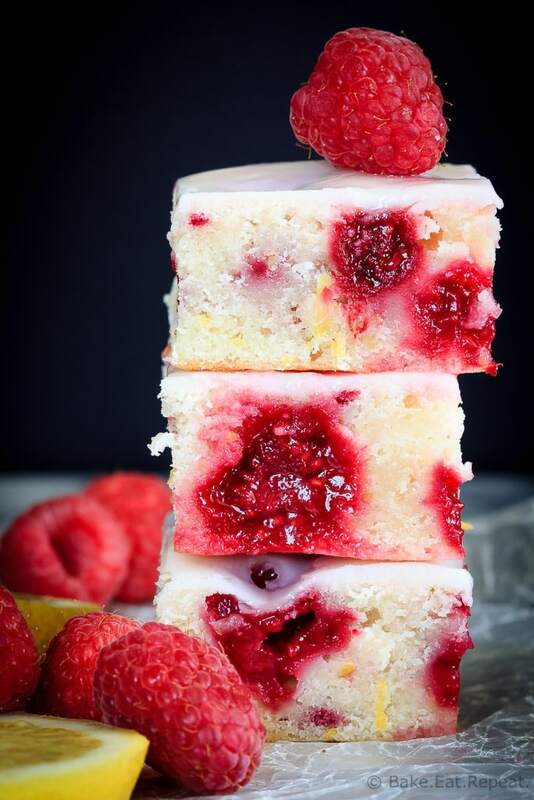 It’s totally not necessary, you can keep them at room temperature, but then you’ll be missing out on the beauty that is these raspberry lemon blondies cold from the fridge on a hot summer day. Amazing. Yeah, I can skip the chocolate this time – totally worth it! 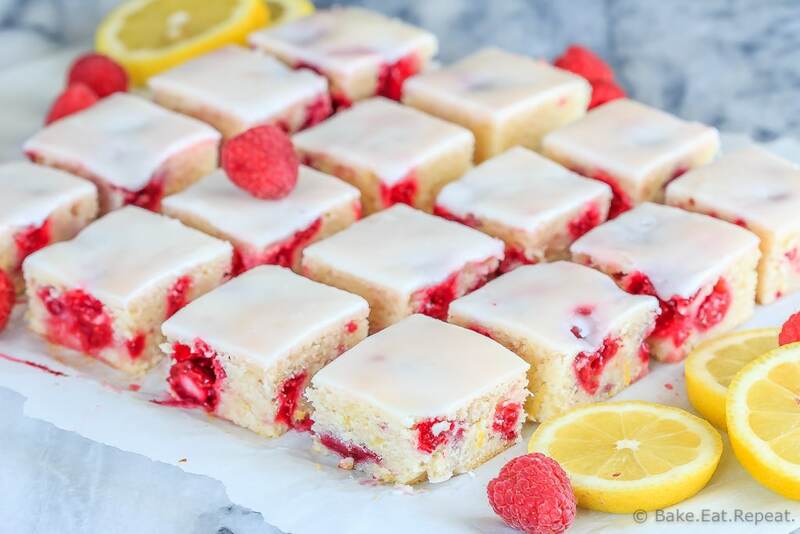 I’ve also shared this Raspberry Lemon Blondies Recipe over on Food Fanatic. They should be good for about a week in the fridge. They also freeze well. Will 3 whole eggs work instead of 2 and 1 large egg yolk? I haven't tried that, but it will likely change the texture of the blondies. They will probably be less chewy and more cake-like if you add the extra white. Can I double the recipe and make it in a 9x13? Yup! I've done that and it works just fine!